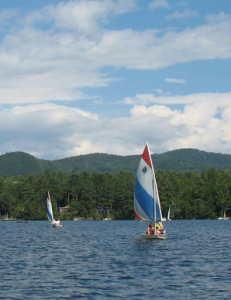 The mission of the Lake Morey Foundation is to protect, preserve, conserve and enhance Lake Morey in Fairlee, VT, and its watershed and viewshed as an environmental, recreational and economic resource. The Foundation encourages and expands upon the efforts of other local organizations to enrich the ecosystem of Lake Morey. Our goal is to facilitate an interactive community revolving around Lake Morey’s water quality, along with its natural and man-made surroundings. We believe that meeting the critical needs of Lake Morey today is an investment in the vitality of its future. Your financial support is crucial to carrying out these objectives! During 2018 the Lake Morey Foundation, through the generosity of 97 donors, purchased 148 acres on Morey Mountain and transferred ownership to the Upper Valley Land Trust for conservation stewardship. Future plans include low-impact trails, educational programs, and ongoing resource management of this critical piece of Lake Morey’s watershed. Read about this initiative here!